*EXTENDED BOOKING DATES. BOOK BY MARCH 7th by calling (757)213-3001 for the best rate. 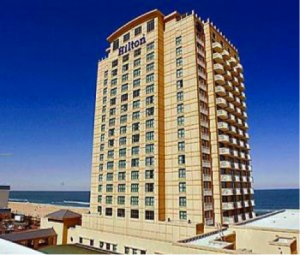 Enjoy a beach vacation in Virginia at Hilton Virginia Beach Oceanfront located only 20 minutes from Norfolk International Airport. 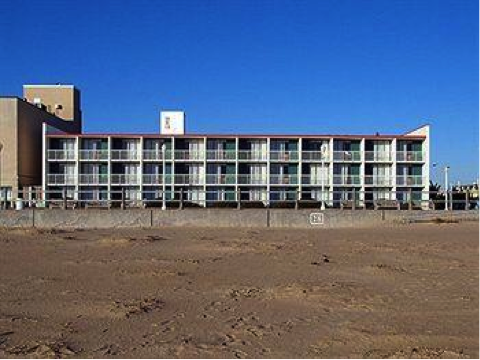 Take a few steps to reach all the vibrant attractions of Virginia Beach Boardwalk. Unwind in one of the hotel’s Virginia Beach oceanfront guest rooms, decorated in serene hues of blue and green while taking in sweeping views of the city or the ocean. Take advantage of the WiFi or relax watching the 37-inch TV. Choose a room in the exclusive Empyrean Club for upgraded amenities including 42-inch TVs, bathroom TVs and access to the secluded Executive Lounge with complimentary continental breakfast, evening hors d’ouevres, and cocktail service. Relax to the gentle sound of rolling waves on our wide, clean beach, as porpoise’s surface and dive in the distance. 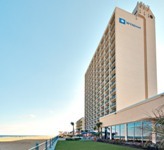 Located on the exclusive North End of Virginia Beach, the Wyndham Virginia Beach Oceanfront is an award-winning, full-service hotel with 244 richly appointed guest rooms, with one and two-bedroom suites available. Your room or suite offers complimentary coffee and teas, MP3 player alarm clock, free wireless internet access, microwave and refrigerator. Every guest room has a private balcony or patio. 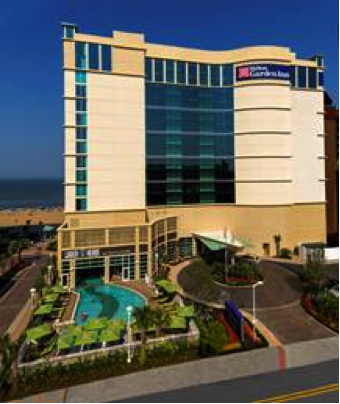 The Wyndham Virginia Beach Oceanfront also hosts The Surf Club Ocean Grille, excellent dining in a fabulous atmosphere with stunning oceanfront views. Our restaurant offers a completely new dining experience with deliciously fresh land & seafood, an extensive wine list and more! Take advantage of the hotel’s pool, oceanfront exercise room, and Jacuzzi. The DoubleTree Virginia Beach is a 292 room, full-service hotel adjacent to the Virginia Beach Convention Center. 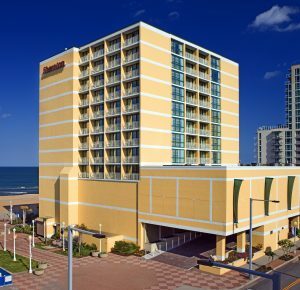 The DoubleTree offers plenty of free parking and a location just eight blocks from the sand and surf of the beautiful Virginia Beach Oceanfront and Boardwalk. Amenities include an indoor pool, Precor fitness center, gift shop, and Max & Erma’s Restaurant on site. Our rooms feature either two double beds or one king bed. 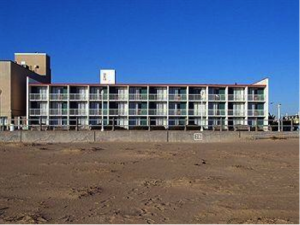 Right on the beach, The Oceanfront Inn features comfortable guaranteed oceanfront rooms with refrigerator, coffee-maker, and private balcony; refreshing indoor pool, free WiFi, 1 complimentary parking space per room and friendly staff at affordable prices. As an additional feature, open at 7:00 a.m. and conveniently located adjacent to the lobby, Neptune’s Restaurant offers a full menu for breakfast, lunch and dinner specials and adjacent to Murphy’s, The finish line celebration! Comfort Suites Beachfront is currently number 2 on Trip Advisor. Every room in our hotel is oceanfront, and every room is a suite. 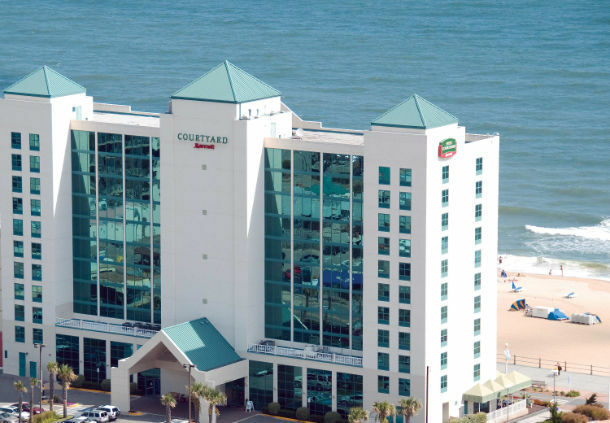 Complimentary hot breakfast, on-site parking and an oceanfront work-out facility make Comfort Suites Beachfront an unbeatable choice for a marathon weekend! For this special rate, be sure to mention Shamrock Marathon when calling the hotel directly to make your reservation. Thank you for returning to us! We look forward to seeing you in 2019. 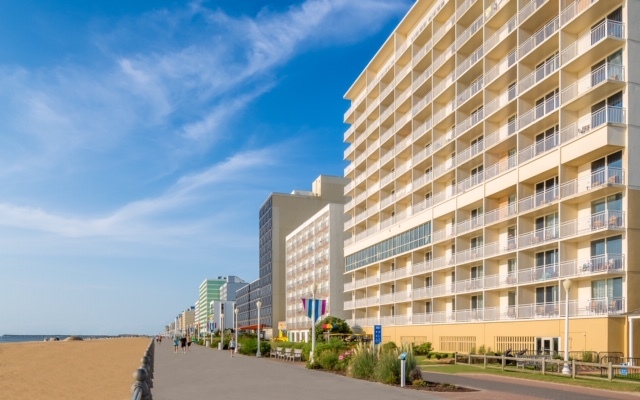 A great value and always family friendly, the Best Western Plus Virginia Beach is located on the oceanfront and just steps from the newly expanded 31Ocean, Virginia Beach’s focal point for shopping, dining, and entertainment. All guest rooms feature either 1 king bed or 2 double beds, microwave, refrigerator, coffee maker, complimentary wireless internet and in-room safe. 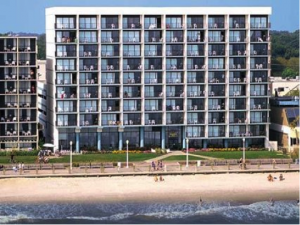 Oceanfront rooms have a private balcony or patio overlooking Virginia Beach’s famous Boardwalk and offer unobstructed views of the Atlantic Ocean. Our non-oceanfront rooms are located across the street from the main hotel in our 3-story motor-inn with exterior corridors. You don’t need a four-leafed-clover to get the newest hotel on the beach – just be sure to book your room now! The HYATT HOUSE is located in the center of the race course and our special rate is for runners, fans, and leprechauns. Fans can cheer the runners on from their oceanfront-boardwalk balcony with their favorite green beverage in hand. 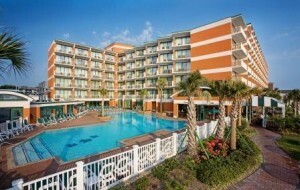 This rate includes a wonderful hot breakfast with an omelet station, wi-fi, use of our indoor pool, and fitness room. Choose a room with one king bed with queen sleeper sofa & kitchen OR a room with 2 queen beds, microwave & refrigerator. Guests (up to 4 people to a room) may stay at this discounted rate of $189.00 + tax 03/15/2018 – 03/19/2018. Parking fees are extra at $9 self or $14 valet. To receive this special rate you must book prior to March 1, 2018! Splash into 250,000 gallons of fun or enjoy our 48-seat movie theater with your family before relaxing on your private balcony with a beautiful over view. Be close to all the action, our hotel is less than 8 blocks to all the races this weekend! Guests staying with us will enjoy Complimentary Grab and Go breakfast in the morning. Lunch & dinner are provided oceanfront by The Square Whale and our third restaurant, the Isle of Capri features Italian fine dining & breathtaking beach views! All rooms include mini-refrigerator, microwave, Keurig, flat screen, iPod station & free WIFI. You can still enjoy the pool and avoid the sun in our indoor Lazy River that features waterfalls, two hot tubs and a beautiful ocean mural! Daily activities are available for toddlers to ‘tweens in our seasonal kid’s club Splash Kamp and be sure to visit our two African Tortoises Tink & Tonka who live with us year-round. Treat your family to a mini-vacation in Virginia Beach they won’t soon forget! Our Shamrock Runners Annual Pasta Buffet is served Saturday 03/16/18 featuring a Salad Bar, array of sides and desserts and most importantly, delicious Pasta offerings! Newly renovated! The Courtyard Oceanfront South on 25th Street offers 100% oceanfront rooms located in the heart of the boardwalk close to shopping, dining, and entertainment. Each of our spacious rooms and suites feature plush bedding, 32″ flat screen HD television, a mini fridge–and a private furnished balcony facing the ocean. Unwind in our sparkling pool and whirlpool spa. Grab a quick bite from our Bistro, which offers healthy choices, a variety of breakfast and dinner options, an evening bar, and specialty beverages made with Starbucks® coffee. Our Marriott Courtyard offers complimentary Internet throughout the entire hotel as well as complimentary parking for guests. In addition to the great amenities at our Virginia Beach Courtyard hotel, we’re proud of our service. Come and give us the opportunity to serve you! Our Virginia Beach oceanfront hotel has recently completed a full renovation, redesigning all guest rooms, meeting space, indoor pool and public areas with a modern beach feel. 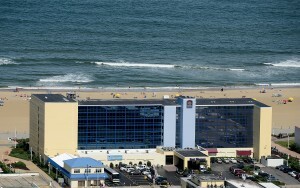 We offer direct access to the ocean and are just steps away from year-round events on the boardwalk. 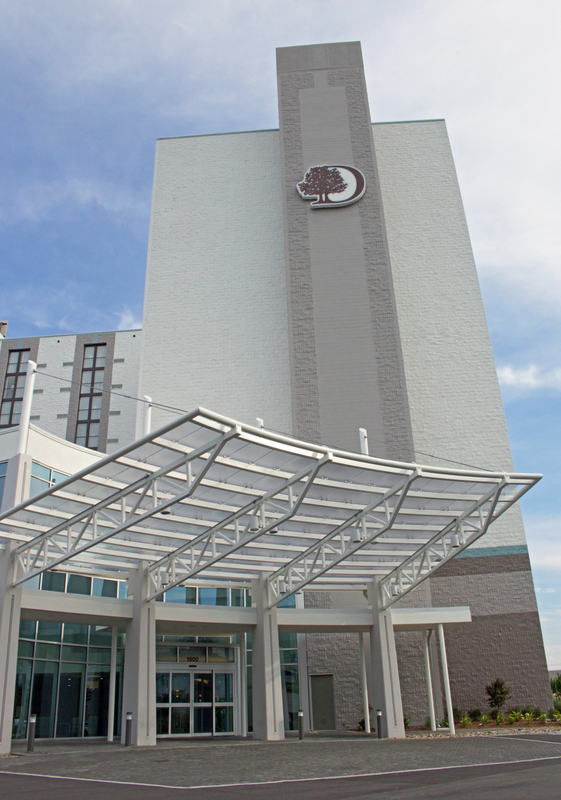 Our Courtyard hotel is also conveniently close to the Virginia Beach Convention Center, Virginia Beach Sportsplex, Dam Neck, and Oceana NAS. Each of our oceanfront guest rooms and Courtyard Suites® features a 32″ flat-screen TV, luxurious bedding, a mini-fridge – and a private, furnished balcony overlooking the beach. Drop by The Bistro – here at our hotel – to enjoy breakfast, lunch, or dinner on our beachfront patio. Step into our on-site Starbucks to indulge in one of your favorite beverages. Meet friends and colleagues in our comfortable, state-of-the-art lobby that features a touchscreen GoBoard with the latest news, weather, and airport information. Unwind in our glorious tropical pool, with its cascading waters, rock formations, and swaying palms. Or enjoy an invigorating workout in a new, well-equipped fitness room that offers free weights as well as 22″ TVs on all machines. Welcome to Shamrock Country! 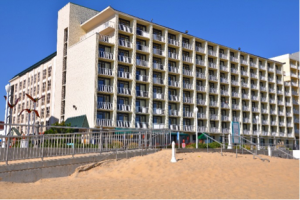 Sleep well at the Country Inn & Suites Virginia Beach Oceanfront featuring all oceanfront rooms with private balconies and a view of the ocean, beach, and boardwalk! Start your day with our free hot and delicious Be Our Guest Breakfast, stay connected with our complimentary WIFI, and ON-SITE garage parking. Relax in our heated indoor pool, recharge in our fitness facility, or get caught up in our business center! All rooms have microwaves and refrigerators, and there’s free coffee and cookies in the lobby! There is a two-night minimum stay requirement for Shamrock Marathon Weekend, and Country Inn & Suites is offering a late check-out rate of $65.00 until 5pm on Sunday night, or you’re welcome to stay the entire night for just $110 plus taxes on Sunday night! 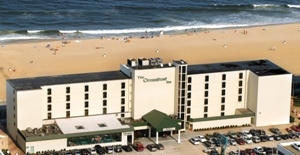 Welcome to the Comfort Inn & Suites Oceanfront, an award-winning Virginia Beach Oceanfront Hotel. Located in the heart of the resort area, the Comfort Inn & Suites Oceanfront is right on the boardwalk providing a breathtaking view of the ocean. All of our two-room units are oceanfront and contain two queen beds or one queen bed and a queen sofa sleeper. Every unit contains two flat screen TVs, an in room safe, a refrigerator, microwave and coffee maker. Start your day with our free hot breakfast featuring eggs, meat, yogurt, fresh fruit, cereal and more, including hot Belgian waffles! Relax in our heated indoor pool and hot tub. Stay connected with the world in our business center or with our free high speed wireless internet access. Our exercise room features an array of fitness equipment to meet your conditioning needs. We also provide one parking space per suite in our on-site parking garage. The entire staff at the Comfort Inn and Suites Oceanfront looks forward to serving you and is dedicated to ensuring that your stay with us will be pleasantly memorable. 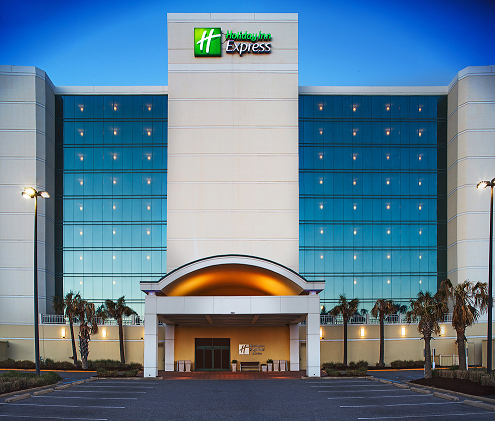 **Stay with us at the new Holiday Inn Express & Suites and experience the same great service you’ve come to love when staying at the Oceanfront. Our upbeat décor and interior enhancements with remodeled guest rooms and public spaces will impress the whole family. The name may be Holiday Inn Express & Suites but your vacation will be at your own pace at the Virginia Beach Oceanfront. All of our guest rooms include a complimentary hot breakfast and have a private balcony with a full oceanfront view of the beach and boardwalk, mini-refrigerator, hair dryers, coffee makers, free high-speed Internet access, and complimentary onsite parking. For fitness room. We look forward to serving you! As a guest of the Holiday Inn Virginia Beach Oceanside, you’re treated to a stay in the heart of the resort district, which means you’re just steps away from fun, food and festivities. Situated directly on the Boardwalk, our hotel offers direct beach access and is walking distance to more than 20 restaurants and lounges. Each of our newly renovated hotel rooms has a private oceanfront balcony that overlooks the beach and boardwalk. Other room features include free fast high-speed Internet access, refrigerators, microwaves, 32″ flat screen HDTVs with HBO and triple-sheeted bedding. 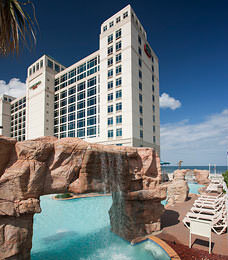 Take a dip in our indoor pool and then unwind in our oceanfront full service restaurant/bar, Sip Sip. 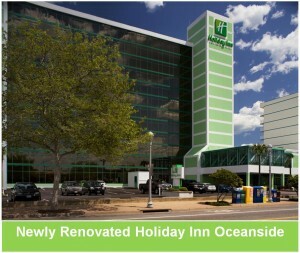 For a hotel experience that exceeds your expectations, at a price that will delight you, choose the Holiday Inn Oceanside for the Shamrock race. During race weekend our hotel will be offering a pasta buffet. All of our rooms at the Econo Lodge on the Ocean are oceanfront with a private balcony or ground floor patio overlooking the beach. You have a choice of two double beds or one king bed with sleeper sofa. Each is equipped with a microwave, refrigerator, in room coffee maker, hair dryer, iron/board, and in room safe. Hotel amenities include an outdoor heated swimming pool, free bicycles for our guests, and free high speed wireless internet access. A complimentary continental breakfast is served each morning from 7 am to 10 am (with early hours on race day!) Our guest parking is on site, 1 car per room. 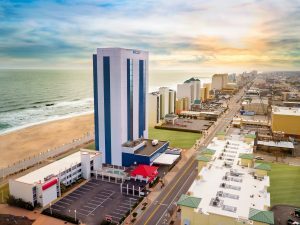 Virginia Beach’s newest hotel on the boardwalk offers 167 oceanfront guestrooms, including 24 suites, all with private balconies. 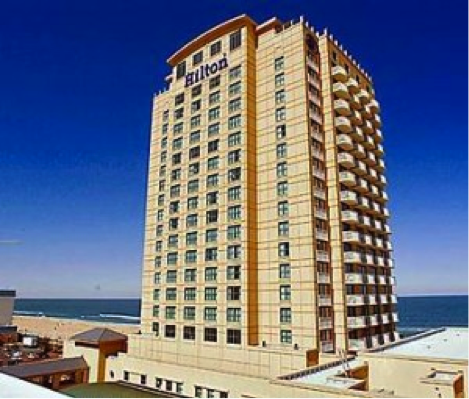 Our 5,000 square feet of meeting space features an oceanfront Executive Boardroom with the latest in video conferencing, 3,000 square foot ballroom, and a large balcony overlooking the boardwalk and Atlantic Ocean. Guests will never be far from the beach with two oceanfront restaurants onsite. Lager Heads and the Garden Grille, offer breakfast, lunch, dinner or late night dining as well as patio seating, fire pits and live entertainment nightly in season. The hotel also features an upscale indoor/outdoor pool with in-pool chaise lounges, an expansive sun deck with panoramic views, a fitness center, a 24-hour convenience mart and a business center.